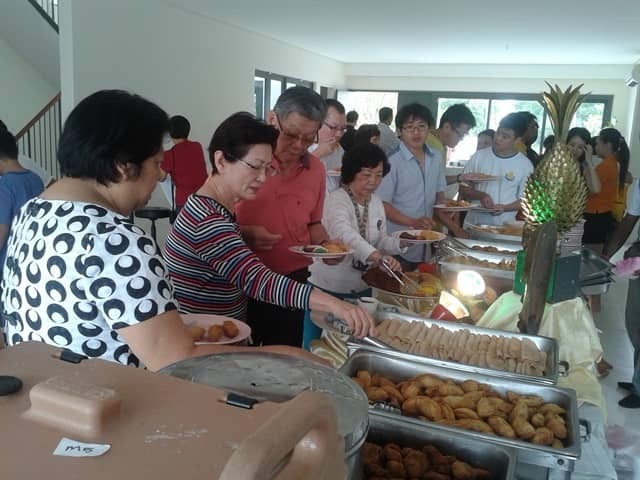 Buffet Catering Services Penang is a popular trend. Whether for a wedding, birthday party, public event, product launches, seminars or a baby shower, buffet catering in Penang is seen as the go to choice of food setup. Buffet catering is very straight forward for a party, function or event. You have a side table. One side easily accessible by a queue. The starting end will have a stack of plates. Then a row of serving trays, preferably on heaters to keep the food warm. The cutlery and paper napkins are laid out at the end of this buffet row. Then on a separate table, a container dispensing the drinks, and in Penang’s case, mostly fruit juices or traditional drinks like Air Bandung or Air Selasih. That’s it. A very simple layout. Now comes the complex part of buffet catering. For a large buffet catering event, you need servers to ensure that the crowd moves fast. And spare food is keep in hot in containers out of sight. These will be hauled in, once the food on the serving trays run low. Spills will happen, and servers need to be on hand to ensure the tidiness of the buffet table and drinks table. Used cups and plates will have to the removed from these tables. Buffet catering is a catch all phrase. At Catering Penang DotCom, a more precise term would be best for your needs. For example, you may want easy to eat food, great for for a stand up party where the guests are moving and mixing. Thus you should ask for Finger Food Buffet Catering. Or maybe its meant for a sales launch, where you would like the guests to mingle with your sales people eating at a table or high table together. Then you would want a Product Launch Buffet Catering, with appropriate seating layout and food. And if you have Muslims, and in Penang, being a great multi cultural state, we will invariably invite our Muslim friends and customers to our parties. So then you will want a Halal Buffet Catering, where the food is prepared and served according to Islamic practices. Our buffet catering services penang is suitable for people having a budget in mind. We work within your catering budget to give you your ideal menu. You choose what you want for your buffet. Catering Penang DotCom will deliver it.